A weekend detox is a fantastic way to introduce the concept of detoxification into your life. Grab some comfy clothes, rent some funny movies and switch off your mobile – you’re ready to begin! Being enthusiastic about starting to detox your body is a great feeling, but there are a few very important things you must do before you begin your weekend detox. The first is to put temptation, in the form of all ‘banned’ food and drink, firmly out of reach. Lock or give them away for the duration – don’t underestimate the willpower of a mind deprived of its favourite treats! Before you begin your detox make sure you’ve got all the food you need to last you through the weekend. You may not feel like going out for more provisions, and in any case, supermarkets are full of temptation! Tell loved ones about your diet so that they know what you’re going through. Prepare them for mood swings and help them to make your weekend as easy as possible. Put together a menu plan before you shop. There are lots available on the Internet and you’ll be able to adapt one or more to suit your personal tastes. If you don’t already have one, buy or borrow a juicer or blender so that you can whizz up your own fruit or vegetable juices when you feel hungry and creative. Juices are one of the best ways of giving your body a fast and easily absorbed nutrient hit. 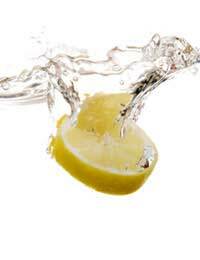 First thing in the morning, kick start your detox with a refreshing cup of hot water and lemon. Caffeine’s off your menu, but your liver will love you for it. Fruit is your best breakfast friend, providing a good serving of vitamins, minerals and enzymes to set your system up for the day. If you need warming up, try porridge made with water instead of milk, and add honey to sweeten if necessary. Typical lunchtime meals don’t need to be dull. Protein will keep you full until later on, so choose fish or chicken (if permitted) and serve with some steamed or stir fried vegetables or whole grains. It might feel extravagant for a lunchtime, but remember you’re feeding your body during your diet, not starving it. By keeping your larger meals to lunchtimes you’ll go to bed feeling less full and put less of strain on your body to digest a big meal. Overnight your body needs all its energy to repair and regenerate, so choose a lighter option and try to eat relatively early. This will give you more time to enjoy your evening’s relaxation activities! Detoxing the mind is as important as cleansing the body, so spend your two days of solitude in as relaxing a way as possible. Don’t feel guilty about curling up with a good book, and remember that laughter is a great antidote to stress. Comedy movies, pamper sessions and gossip magazines are all fantastic ways to lighten your mood. If you do feel like venturing out, why not try a yoga class? In two days your body can make a great deal of detox progress. Drink water regularly and enjoy the feeling of eating fresh, organic produce. By Monday morning you’ll be more than ready to face the day.